If it does not feel like a meaningful life, why go on living it? 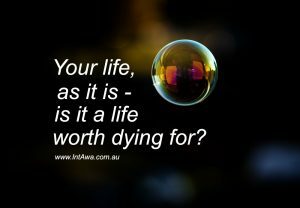 Or perhaps the question is ill-formulated, and should rather be; if your life is so filled with activities and duties that you never have a moment to consider its meaning, can you then truly say that you made the most of it, that you truly lived? Viktor Frankl argued that the primary desire of every person is to experience a deep sense of meaning. Joseph Campbell seemed to disagree, when he said, “Life has no meaning.” But how different are their perspectives, really? And what can we learn from them with regard to pursuing a meaningful life? Viktor Frankl (26 March 1905 – 2 September 1997) was a Jewish psychiatrist and neurologist from Austria, who spent three years in a Nazi concentration camp at the end of the second world war. As he saw it, the most important thing for surviving in the camp was having a sense of meaning to one’s life. Frankl’s book “Man’s Search for Meaning”, which is based on his experiences and insights from the camp, was published in 1946 and has been a best seller ever since. Like Sigmund Freud, Frankl lived in Vienna, and as a psychiatrist of that time was obviously influenced to a great degree by Freud’s formulations about the human psyche and what drives us to act, or not act. Frankl challenged some of Freud’s thinking, though, writing “Life is not primarily a quest for pleasure, as Freud believed, or a quest for power, as Alfred Adler taught, but a quest for meaning. The great task for any person is to find meaning in his or her life.” The way Frankl saw it, people sought pleasure not as a primary drive, but rather as a way of numbing themselves when they were unable to find meaning in life. Frankl considered every person to have his/her own mission in life, and to pursue this mission was a unique task for this particular individual in this particular lifetime. In other words; no one else can replace you in carrying out your life assignment, and you only get one shot at it, as your unique life cannot be repeated. According to Frankl, there are three components of a meaningful life. To have a purpose in the world. To have an important project that demands our attention and requires us to get out of bed every day to pursue it. Frankl saw it as essential for being human, that we give ourselves to serving a cause or loving another person. The more you do that, the more human you are and the more you actualize yourself. To be surrounded by people who love and accept us as we are. The human life is best lived in community and relationships with others really matter. To experience a deep sense of meaning, you need close, loving relationships. At the same time, however, Frankl is also aware of our limited ability as human beings to actually grasp the meaningfulness of life; “What is demanded of man is not, as some existential philosophers teach, to endure the meaninglessness of life, but rather to bear his incapacity to grasp its unconditional meaningfulness in rational terms.” And here is where we may find a bridge of sorts to the thinking of Joseph Campbell. Joseph Campbell (26 March 1904 – 30 October 1987) was an American mythologist, writer and lecturer. His work covers many aspects of the human experience, and he is best known for his work in comparative mythology and comparative religion. In collaboration with Bill Moyers of the Public Broadcasting System in the US, Campbell gained wide recognition through the TV series “The Power of Myth”, which was broadcast the year after Campbell’s death. The book “The Power of Myth” was released shortly after the original broadcast, with expanded transcripts of the conversations in the TV series, and is still attracting a great number of new readers each year. Frankl and Campbell used different words to express themselves, but to me it seems they agreed more than they disagreed. As long as we don’t get hung up on the differences in terminology, they both seem to strive for something that transcends the limited perspective of the individual person. And to strive for this through being really true to our innermost nature. Living a meaningful life is closely related to being authentic, to being who we truly are. It is also strongly related to sharing of ourselves with others; to let others connect deeply with us, by sharing of our personal inner experience as human beings. To make this possible at all we need to be present, both to each other and to our own inner experience. It is in this sharing of our inner worlds that we find the true sense of closeness and belonging that is a prerequisite for having a meaningful life. This article was first issued via Authentic Living! – the newsletter for Integrating Awareness. Please notice, however, that not all newsletters are reproduced on my website. To make sure you don’t miss out on something interesting, subscribe now – it’s free! Subscribe to this complimentary newsletter, and receive the professional report "The 7 Secrets to getting the most out of Counselling and Life Coaching" for free!